ZATTA -L'Estremadura di Portogallo Alentejo, ed Algarve. . .
ZATTA, A - L'Estremadura di Portogallo Alentejo, ed Algarve. . . Title : L'Estremadura di Portogallo Alentejo, ed Algarve. . ..
Map maker : ZATTA, A. Size : 15.3 x 19.0 inches. / 38.7 x 48.3 cm. 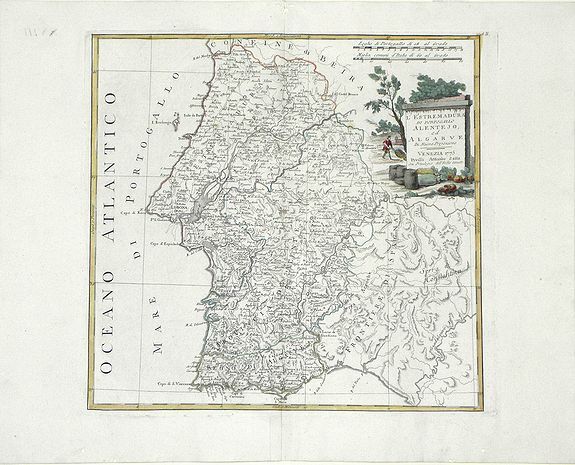 Description :Map of the regions of Algarve and Alentejo of Southwestern Portugal by Antonio Zatta. The city of Lisbon is depicted along the western coast, as are the other towns, villages, forests, mountains and rivers of this area of Portugal. An illustrated title cartouche is at the top right corner. Antonio Zatta (1775-1797) was an Italian map publisher based in Venice. Zatta redefined the traditional title cartouche by replacing the mythic elements common to the 17th and 18th century with more representative images from the region depicted in the map. His most important work is the four volume "Atlante novissimo" published from 1775 to 1789. Condition : Wormholes at top center margin area and in bottom left and right margin areas. The notation “XVIII” appears in ink in on the verso upper right corner.